Now this is a grilled cheese sandwich. On a parchment paper-lined cookie sheet (with sides), lay out the asparagus so that each spear is setting flat on the pan. Drizzle olive oil on the asparagus and turn each spear so that the oil covers all sides. Add salt and pepper to both sides of the asparagus and bake in a preheated oven for 14 minutes. The spears should still have a little crunch to them. Set aside. Spread butter on all sides of the bread. On the sides of the bread that are facing up, sprinkle granulated garlic on top of the butter. On 3 slices of bread, top the garlic butter with half of the cheddar and mozzarella cheese. Cut the length of the roasted asparagus so that each spear is equal to the length of the bread. Lay the spears of asparagus on top of the shredded cheese. 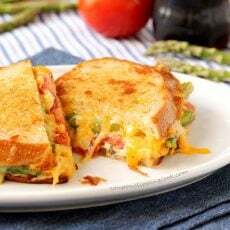 Top the asparagus with the remaining cheddar and mozzarella cheese. Sprinkle salt and pepper on top of the tomato slices. Lay the slices of tomato on top of the cheese. Top the tomato with fresh chopped oregano. On the 3 remaining slices of bread, on the sides with the garlic powder, spread the goat cheese. Lay these slices of bread (goat cheese side down) on top of the shredded cheese. Heat a pan on low to medium heat. Use a spatula to set the sandwiches on the pan. When the bottom sides of the bread turn a golden brown color, turn the sandwiches over (the cheese on that side of the bread should be melted by that time). Let the other side of the sandwiches cook until they turn a golden brown color and the cheese is melted. Cut each sandwich in half and serve right away.